Arrive in historic Essex and ride the rails to your steam boat adventures. 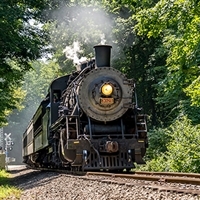 Depart from the station for a ride through the beautiful countryside of the Connecticut River Valley aboard a true Steam train with vintage rail car. Travel along taking in the sites including the historic Goodspeed Opera House, the majestic Gillette Castle, Flora, fauna, wildlife and more. Enjoy an included dinner then arrive and check-in for a one night stay in Mystic, CT. Enjoy an expanded continental breakfast before departing for Boston. Discover this Capital city including the USS Constitution, Beacon Hill, the Freedom Trail, Boston Common, Bunker Hill, Boston Public Garden, State House, Rose Kennedy Greenway, historic Feneuil Hall and Quincy Market. Climb aboard the Boston Harbor Cruise, a relaxing narrated cruise where passengers will see the bustling inner harbor. Learn about the past, present and future of the historic waterfront area, Charles Navy Yard, fishing industry, Tea Party site and more. Arrive and check in for a three night stay in Dover, NH and freshen up for an included dinner. Enjoy expanded continental breakfast and depart for Winnipesaukee scenic railroad and ride the train to your cruise. View this impressive lake from the shore as you travel over the historic tracks of the Boston & Maine railroad. Arrive at Lake Winnipesaukee and relax and enjoy a beautiful lunch cruise on this 72 square mile lake the largest in New Hampshire, surrounded by three mountain ranges. Spend time on your own in the charming lakeside village of Wolfeboro, New Hampshire, then travel back to the hotel for dinner on your own. Begin your day with expanded continental breakfast and then take a trip back in time as you enjoy magnificent views of Portland's waterfront aboard antique rail cars pulled by hard-working steam and diesel locomotives. Stop for lunch on own and shopping in Old Port, Portland and historic Shipyard Brewery. Travel Maine's rugged, rocky coast on the Lighthouse Lover's Cruise viewing as many as seven lighthouses. Finish the day with a Maine Lobster bake Dinner with a dose of downeast entertainment. Begin the day with an expanded breakfast then climb aboard the Downeaster, Amtrak's coastal train from Dover, NH to Woburn, MA. Take in the incredible views and the beauty of coastal New England. Depart for Pennsylvania. Deluxe Motorcoach Transportation, Four nights accommodations, Four expanded continental breakfasts, One luncheon cruise, Three complete dinners including a Maine Lobster Dinner with entertainment, all attractions and guide service.